15 Park Avenue is a milestone in Indian cinema in the English Language. Aparna Sen, actor, director and a poet makes this film for an intelligentsia who has to dare to question the conventional therapy laid down in the treatment of a mentally handicapped and how much sane we might be at the present moment. 36 Chowringhee Lane, Mr. and Mrs. Iyer and now 15 Park Avenue, Aparna Sen, a resident of Kolkata to its heart brings forth a story of an upper intellectual class Bengali family of Kolkata who has a family member suffering from schizophrenia and epilepsy. The film is about shadows, shadows of failed relationships, shadows of psychosis, shadows that borders between sanity and insanity. Aparna Sen based this film on a true life happening that gave the impetus to surround images to the final making of the film. Konkona Sen Sharma is the daughter of Aparna and Mukul Sharma. Mukul Sharma, a well known Indo English poet has instilled all the talents of poetry in acting in her beautiful daughter Konkona. I saw Konkona in the seventies when she was visiting the Kolkata zoo with her mother; her photographs were splashed all over Youth Times. Konkona plays the role of disturbed Mithi. The movie tries to address quite a few things in one go starting from the unique world of a disabled person to the unequal status of a female even in today's modern India and also the twisted relationships in a tattered family. There is a poignant love story almost a poem between Mithi (Konkona) and Jojo (Rahul Bose) in Kolkata and Mithi living at the edge of Schizophrenia. 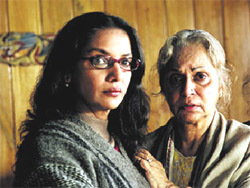 She is taken care by dominant elder sister Anjali ( Shabana Azmi) who is a divorcee and is trying to manage a relationship with an university colleague ( Kanwaljeet Singh. Mithi's dormant schizophrenic symptoms are manifested after she was raped by three political gangsters in Bihar where she had gone to collect news for her journal. Jojo leaves her and Mithi starts living in her own world of delusions, hallucinations and sometimes convulsive fits. Schizophrenia is not a single disease item but rather a syndrome of psychological symptoms which the patient believes are true. There is a point when nobody believes that Mithi use to stay in 15 Park Avenue with her husband Jojo and their five children. She tells coolly the exasperated sister that if I have to say that you are not a Professor and you are making it up all the time, how you would feel. In the real world 15 Park Avenue doesn't exists as much as Jojo and her five children. Yet many a time she hears voices talking to her, children's laughter and the need to reach her home at 15 Park Avenue urgently. Some tantalizing experimental evidence does exist that suggests that the stimulation of the brain by an external magnetic field can rekindle old, dormant memories - and 'create' new hallucinations ("Temporal Lobe Epilepsy"). It has been seen that people with TLE might be more prone to supernatural phenomena. There might also be an element of chaos and 'non-reproducibility of results' involved here: if the reports are anything to go by, phantoms should appear all over the place. Clearly this is not the case. Perhaps they require certain environmental conditions to be (even approximately) met before they appear. The effects of strong magnetic fields on the brain, causing transient Temporal Lobe Epilepsy has been noted above: this can produce hallucinations and was trumpeted as an "explanation" for ghosts. But the actual fields required are so large it is highly doubtful that they could be produced naturally on the Earth. Temporal lobe Epilepsy has been widely seen to be associated with Extra Sensory Perception, TLE remains a disease that can be controlled. The patient's so called imaginary world must be taken seriously and confidence should be created to let you enter that world. Mithi's world was real, she tried her best to let people believe and finally when she stumbled on to her supposed home at 15 Park Avenue on an ancient house in Park Street/Ballugunje corner, she found everything that she was looking for. She just went in and disappeared. Only the Psychiatrist (Dhritiman Chatterjee) understood and was seen leading everybody away from that house. A very old lady was seen to come out of the house. Aparna Sen must have taken cue from James Hilton's Lost Horizon. He finds the sky to be still blue'..